10 minutter fra alle seværdighederne i Paris med metroen, der ligger ved foden af ​​metroen Tolbiac, letter rejse, lejligheden er i stueetagen gården af ​​en smuk gammel bygning helt sikker. Dækker et areal på 42 m2, overordentlig roligt, det blev fuldstændig renoveret, møbleret og smukt indrettede i begyndelsen af ​​2012. Han er charmerende og velegnet til de behov, en familie eller et par besøger Paris. Den stue, med to store vinduer, indeholder en sofa med en reel ekstra dobbeltseng. Det store soveværelse er romantisk, med en stor 160x200 seng, en dobbelt gardinerne prydet med store, fladskærms-TV (ud over stuen) og en smuk garderobe. Køkkenet er nyt og fuldt udstyret til den bedste kok (r). Badeværelset er også nyt. Et sted af charme og ro til at inddrive gåture og varieret fornøjelser for turisme i Paris. Tæt på metro Tolbiac, på linje 7, som er særlig praktisk at nå hurtigt centrum af Paris og alle fokus. Badeværelse fuldt ombygget bad har en vask skab hvid lakerede skuffer, toilet og en stor bruseniche. Elektrisk håndklæde. We are a family of six, and stayed in the flat for 5 days. The flat is nice, but quite small. It was okay for us, since we were out all day, had lunch and dinner out, and pretty much just used the flat for sleeping. The flat was facing the court yard, and it was nice and quiet. The location is good - close to the metro and close to underground parking. Disappointing, especially based on reviews we had read! My husband and I just left this apartment. We had rented it for 9 days. There are positives and negatives. 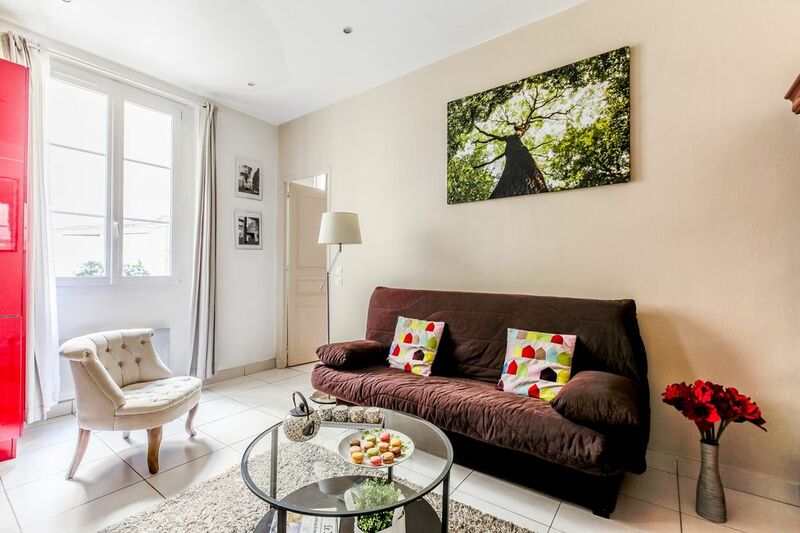 The location is excellent with easy access to the Metro and good shops and restaurants nearby. As we were packing, I double-checked the VRBO listing to make certain that there would be a hairdryer. It said there was, but when we arrived, there was no hairdryer. I messaged the owner, Maxime, and after he asked me to look in several places, he agreed to purchase a new one and bring it over that evening since we were leaving for Normandy early the next morning. This was excellent service. Another reviewer made mention of the very, very small shower. This is no exaggeration! And, it hadn’t been cleaned properly so there was mildew in the corners. We only were given 2 bath towels and 2 hand towels for 2 people for a 9 day stay! There was no floor mat for the shower. There were also no kitchen towels. Since we had so few towels, we needed to do laundry during our stay. But, while there is a washing machine, there was no laundry detergent. Many things that I consider basics of hospitality for a VRBO apartment were missing and we had to purchase them: soap for the shower, salt & pepper, facial tissues, and we ran out of toilet paper! When the caretaker met us when we checked in, he showed us where to put the trash. We later discovered that there were no trash bags. He also showed us how to connect to the WIFI, but we later discovered that neither of the TV’s seemed to work, or we couldn’t figure out how to work them, and there were no instructions. The entire apartment needs to be refreshed. Paint is worn to raw wood in some places and generally looks dingy. The futon/couch in the living room is uncomfortable and there is no other furniture in the living room on which to sit. The white chair in the photos isn't there. The photos on the VRBO website were clearly staged; perhaps they were fairly accurate at the time they were posted, but this apartment needs to be refreshed and renewed. This was our wedding anniversary trip and while we enjoyed our time in Paris, this apartment was overall a negative. In fact, we left a day early & moved to a hotel even though we had paid for 9 nights. When we let the owner know we were leaving early, I shared our concerns with him. He sent this reply: “Ok thank you for your message. I will try to do what you say!” I hope he does. I'm sorry if you can't appreciate all you have and you know only how to complain whereas we do all we can to please you ! Nous avons pris cet appartement à défaut d’un hôtel avec nos trois enfants. Les hôtels nous facturaient deux chambres par nuit ce qui alourdissait considérablement le budget. Le métro est réellement à deux pas. Tout le nécessaire est disponible dans ce deux pièces. Le grand lit est confortable. Ainsi que le petit lit. Le clic clac a été réservé à nos deux petits. Nous y sommes restés juste pour dormir et prendre le petit déjeuner. Conforme. Ponctualité, propreté bon accueil et très bien situé. Parfait pour un séjour en famille à Paris. Proche métro et bus.appartement bien équipé et propre. Excellent séjour dans cet appartement, tout à fait conforme à sa description et aux photos. Nous y avons passé 4 jours pendant les vacances de Noël, en famille (2 adultes, 2 enfants). Tout était nickel à notre arrivée, le gardien s'est montré charmant et de bon conseil. L'emplacement était parfait pour nous (au pied du métro, supérettes et restos partout autour, sans oublier le parc de Choisy, idéal avec les enfants), et rien ne manquait point de vue équipements. Nous recommandons sans hésiter cet appartement, et nous gardons précieusement l'adresse pour un prochain séjour ! Ideel til at besøge Paris: et par minutters gang fra Latinerkvarteret, lejligheden ligger 20 meter fra Tolbiac metro, linje 7, der gør det muligt at gå på få minutter i alle turist og kulturelle steder i Paris: 10 min at nå Place du Chatelet, VORES LADY BEAUBOURG Centre Pompidou eller 15 minutter for MARAIS Louvre Saint Germain des Prés eller stormagasinerne. Bydelen Butte aux Cailles XIII I PARIS EME er berømt for sine restauranter, de charmerende gader og smukke haver. Dette er en livlig, farverige og kunstneriske område kendt som en lille landsby eller en typisk parisisk oase, hvor folk kan lide at komme spadsere. Supermarked og nærliggende købmænd. Store indkøbscenter Place d'Italie 300 meter med mange biografer. Nem adgang fra Orly og Roissy CDG ORLY af RER B. Flere buslinjer.